Timeless is the one word that comes to mind when Steve Strauss' 1930 Ford Racer is the subject. Not only is Steve's subject timeless, but so are his building skills. Although this model could very well have been a freshly finished project, it isn't. Steve built this car about six years ago, after being inspired by photos in Dean Batchelor's book, "The American Hotrod" and Dain Gingerelli's, "Ford Hot Rods". Today, a car looking like this would be lumped in with the "Rat Rod" crowd, but back when Steve built it, it was a post-war era dry-lakes racer. In the late 40's and early 50's, "Hot irons" and "Soup jobs" like this used to run at Muroc and El Mirage in southern California. Starting with a Monogram 1930 Ford Coupe kit, Steve left the top off and filled the rear inner fender panels. 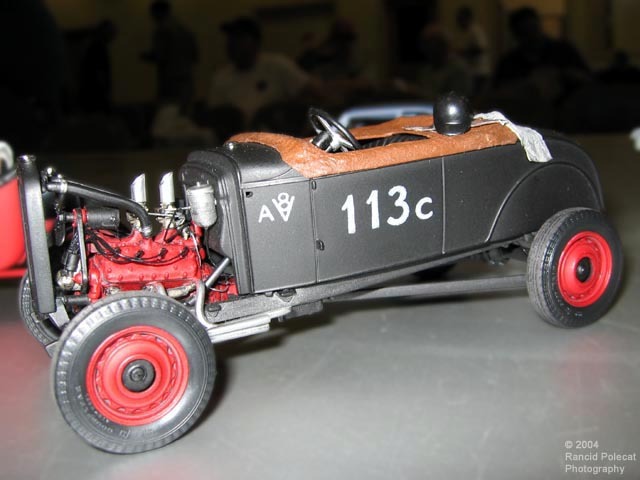 Though the car's frame is from the base kit, the drivetrain, suspension, wheels and tires were sourced from a Monogram 1937 Ford pickup kit.